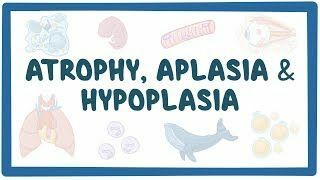 Osmosis: Atrophy, aplasia, and hypoplasia. (2019, April 20). Retrieved from (https://www.osmosis.org/learn/Atrophy,_aplasia,_and_hypoplasia). Atrophy is the partial or complete wasting away of a part of the body. Causes of atrophy include mutations (which can destroy the gene to build up the organ), poor nourishment, poor circulation, loss of hormonal support, loss of nerve supply to the target organ, excessive amount of apoptosis of cells, and disuse or lack of exercise or disease intrinsic to the tissue itself. In medical practice, hormonal and nerve inputs that maintain an organ or body part are said to have trophic effects. A diminished muscular trophic condition is designated as atrophy. Aplasia (from Greek a—not; plasis—molding) is defined in general as "defective development or congenital absence of an organ or tissue." In the field of hematology, the term refers to "incomplete, retarded, or defective development, or cessation of the usual regenerative process."